Discarded toy plastic action figures are a good source of poseable figures for a range of miniature scenes. In scales of 1:12 and 1:24, many action figures are available which can be changed to suit a particular period or need for a figure. Yard sale finds can be repurposed for doll families, or figures for a Christmas village scene. The figures here cost 50 cents and $4.00 at various toy sales. This is a considerable saving over the cost of dolls or figures for Christmas displays or dollhouse scenes. Articulation and Joints—Action figures may come with changeable hands, changeable arms and legs, and various types of joints and joint movement. When choosing figures, aside from the rough scale size of the figure (most inexpensive figures are either 6 inches or 3 inches tall), choose figures which can be adjusted to hold the pose you need for a particular scene. The most difficult poses with action figures involve the figure having sufficient joint movement to sit on a motorbike or a horse or to sit in a chair. Ability to Modify Clothing—If you need to fit removable clothes on an action figure, the arms will usually need to swivel backward. Figures you want to modify with fabric clothing will need to have slim arms or legs, or bare arms or legs. Ability for a Particular Pose— If a doll needs to hold books or parcels to their chest, you will need an arm which can cross the body. If the figure needs to bend at the waist or sit in a chair, it will need particular types of waist and leg articulation and specialized joints. The male figure shown here can extend his arm at the shoulder, and bend his elbow. The female figure cannot extend her arm straight out, but her upper arm will rotate, allowing angled poses. Check figures to see if their articulation works, and where there might be movement you can use before you buy a second-hand figure for modifications. Make sure you look under costumes. Action figures often have movement possibilities which are built in, but not easily noticed as they are restricted by a costume design. Action figures in smaller scales (1:12 and 1:24) don't always have hands designed to grasp other items. Some come with changeable hands and arms, mainly to hold guns or knives, but there are simple adaptations you can make to give your figure a better grasp. First, try to choose a figure with an opposable finger and thumb. The hand on the female figure can easily hold items from sheets of paper to cookies and handbags, due to the way the hand is positioned partially opened. The male figure's hand in this photograph will hold some items but may need to be repositioned slightly for more use. The easiest way to reposition fingers is to gently heat them with hot water or a heat or embossing gun to reposition individual fingers for a wider grasp. Many after market/yard sale action figures have damage to parts of their costume. Action figures which have flexible plastic sections of costume can have those sections peeled off, often leaving useful full costumes in place beneath coats etc. 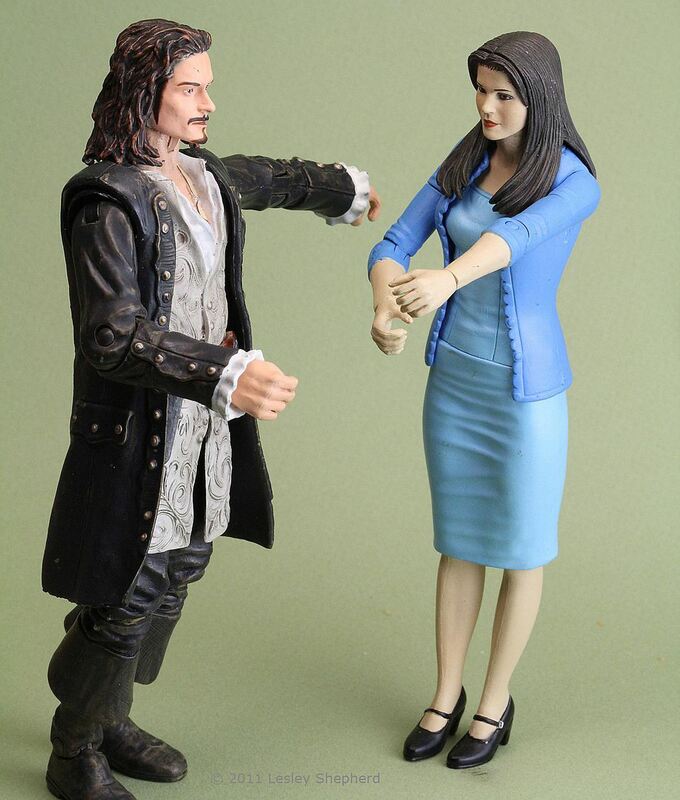 This "Pirates of the Caribbean" figure has a flexible plastic jacket which can be removed in one piece for future use by peeling the jacket off the back of the figure. These flexible costume pieces can slit up the sides to give more movement to the figure where the costume restricts movement (in this case the figure's leg movements were restricted) or they can be completely peeled away as shown. With the outer coat removed, you can see that this pirate action figure still has a very detailed vest costume front and back, although the back now has visible holes where the jacket was attached. The holes in the hard plastic body of the figure can be filled in with two-part epoxy putty once the paint is removed, and the plastic scuffed up a bit. This is an easy modification for action figures with costumes that consist mainly of fabric drape lines. Fine sandpaper should be used on the remaining hard plastic costume areas where traces of the flexible plastic costume still appear (see the shoulders on this figure). Action figure costumes are often composite constructions of hard and flexible plastics. In the action figure shown here, the main body of the coat has been removed, leaving only the coat sleeves on the arms. To change these arms to have a shirt rather than coat sleeves, the hard plastic of the arms needs to be carefully sanded away or ground off with a rotary or flex shaft tool. Once the arm is reshaped, it can be sanded to the same finish as the figure, using special graded sanding pads, like these micromesh sanding pads often sold in automotive supply stores. After sanding, it will need to be finished with a base coat suitable for plastic. (Mr. Base White 1000 is one suitable brand) and then painted with acrylic paints. When assessing costume changes to action figures, note carefully which parts of the costume are hard plastic and which are easily removed flexible plastic. On this figure, the skirt of the vest is flexible plastic which can be easily cut away, while the upper part of the vest on the torso, is hard plastic and will need to be sanded and reshaped if adjustments are needed. If you want figures to have bare arms, it is easier to look for a suitable figure with bare arms to modify or replace the arms of another figure with a similar joint system, rather than trying to recreate them from a heavily molded section of hard plastic. Often action figures have more possible poses and movements than you might suspect when first examining the figure. Removing the long coat on this pirate has allowed enough leg rotation and movement to seat the figure on a horse, and pose not possible before the coat was removed. Further movement can be obtained by splitting the sides of the vest up to the waist. Second-hand figures should be carefully examined to see if the movement of the figure is restricted by costume position, or hard plastic costume sections at the shoulders or hips, which restrict where the legs and arms will move. Figures may have motion restricted by skirts, shoulder details, or jackets and simple modifications will allow the figures to be used in new ways. Action figures commonly come with hard plastic molded hair. This type of hair needs to be cut back or sanded and have new style lines added using two-part epoxy putty, once the paint has been removed. Dental tools can be used to remodel lines for hair. Action figures with flexible hair, usually have a parting line where the hair changes from the hard plastic on the face (the visible front hairline) to the flexible hair which may cover the shoulders. On figures with this type of hair, you can remove the plastic hair, sand down the hairline, and replace the flexible plastic hair with a wig cap and rayon hair or mohair, or with a piece of Tibetan lambs wool hair following the same methods used for wigging dolls. Action figures come with several different types of head joints. They may have a combination of a ball joint for swiveling and a pin joint for up and down motion, or they may have a rotating ball joint which allows for more movement. Usually, the movement of the head allows some downward and sideways movement, but not an upward movement for gazes directed above the eye level. To adjust figures so they can look up, check the head, and see if you can remove a section at the back of the neck where the head is blocked from upward movement of the face (see photo). If you can grind and sand away the section of the head at the back of the neck, this figure will be able to look up. Hair may need to be modified or replaced with a doll wig in order to hide the change to the neck. Sometimes an action figure has details you want to keep, which are affected by other modifications. This figure from the "Buffy the Vampire Slayer" series, has useful costume detail including underwear, which I want to keep. Removing the flexible shoulder draperies on the figure leaves a break in the hard plastic mold lines for the bra straps. To recreate the chain strap effect, I will make a two-part silicone putty mold of the strap lines from areas where they remain undamaged, using a simple one part press mold. While the repair to fill the holes on the back of the figure with two-part epoxy putty is still flexible, the press mold can be placed over it to recreate the raised strap detail across the repair. Second-hand action figures and even new action figures often separate easily at the shoulder and hip joints. To reset a broken leg or shoulder joint, you can often drill out a small hole to a depth of at least 1/4 inch in the figure on the arm, and also into the shoulder socket, using a pin vice or mini drill, or an awl. You can then insert a wire pin into the newly drilled hole in the shoulder socket, holding the wire into the socket with a small amount of epoxy putty or epoxy cement to hold the wire in place without filling or destroying the socket. When the wire is set into the shoulder joint, test fit the arm on the wire, trimming the wire until you get the correct length for the repair. Add a small amount of epoxy putty or epoxy cement to the hole you drilled in the arm, insert the wire, and allow the repaired joint to set. Make sure you don't overfill the hole for the wire with cement or putty, or your joint could be glued together forever!